There’s no reason to be intimidated just because you’re a beginner. You might have a lot of questions, and you may not even know where to begin. Don’t worry; I can help with that. Our experts have even come up with a list of the best cards for you to get. Let’s get started. As a student, I’ll bet you didn’t think you could qualify for a credit card that also earns cashback rewards. Discover offers a variety of cashback cards and some of the best first-time credit card choices for students, including the Discover it for Students and the Discover it Chrome for Students. + Earn 5% cash back at different places each quarter like gas stations, grocery stores, restaurants, Amazon.com and more up to the quarterly maximum, each time you activate. Plus, earn unlimited 1% cash back on all other purchases – automatically. + Good Grades Rewards: $20 statement credit each school year your GPA is 3.0 or higher for up to the next 5 years. + No annual fee. No late fee on first late payment. No APR change for paying late. + Get 100% U.S. based customer service & get your free Credit Scorecard with your FICO® Credit Score, number of recent inquiries and more. + 2% cash back at gas stations and restaurants on up to $1,000 in combined purchases every quarter - no sign-ups needed. Plus, earn unlimited 1% cash back on all other purchases - automatically. + 0% intro APR on purchases for 6 months, then the standard variable purchase APR of 15.24% - 24.24%. These aren’t bare bones cards. They earn cash back and have some other nice perks. Both of these Discover student cards comes with the issuer’s popular cashback match bonus. At the end of your first year as a cardholder, Discover will match all of the cash back you’ve earned in the previous 12 months. These starter credit cards also offer Good Grades Rewards for students carrying a 3.0 grade point average or better. Plus, neither card charges an annual fee or foreign transaction fees. The Discover it for Students credit card offers up to 5 percent cash back on your purchases. You’ll be earning every day with 1 percent cash back on all purchases and 5 percent on quarterly bonus categories. With your cash back total matched at the end of the first year, that adds up to 10 percent cash back for bonus category purchases. The Discover It Chrome for Students offers up to 2 percent cash back. You’ll enjoy 1 percent cash back on all of your purchases, while restaurant and gas purchases earn 2 percent back on up to $1,000 in purchases each quarter. With the cashback match, you’ll be effectively getting at least 2 percent cash back on all of your purchases and 4 percent at restaurants and gas stations. Did you know you can find out if you pre-qualify for a Discover credit card without affecting your credit score? Check out the tips in this helpful guide compiled by our experts. It’ll show you how. Although a social security number is normally needed to apply for a credit card, International Students without a Social Security number may still qualify. Our guide on how to secure a credit card without a social security number gives you all the information you’ll need to apply. If you’re a young adult or anyone else trying to establish credit, the Platinum credit card from Capital One is a good first credit card. The fact that it has no annual fee and gives you access to a higher credit limit after you make your first five on-time payments makes it a worthy choice. It also comes with online and mobile banking, 24-hour access to your account and fraud coverage. Another good option for building credit is to opt for a secured credit card. The difference between a secured card and an unsecured card is that you must come up with a deposit for a secured credit card. The deposit is kept as collateral by the issuing credit card institution while you prove you can manage your credit. An unsecured credit card requires no such deposit as credit is extended to you in advance. A secured credit card may be your best first credit card option if you have no credit history or even bad credit. By coming up with a refundable deposit, usually less than a few hundred dollars, you could get approved for a credit limit amount equal to your deposit. Just make your payments on time and avoid carrying a balance to build a positive credit history with the issuing bank. You could then be upgraded to an unsecured credit card. The Discover it Secured credit card is a good example of a great first credit card, particularly if you can’t get approved for a standard credit card. The Discover secured card does not have an annual fee, and you will even earn cash back. Like the Discover Chrome card, you’ll get 2 percent back on all of your restaurant and gas purchases and 1 percent back for everything else. Believe or not, this secured card even comes with Discover’s cashback match. So all of your cashback earnings will be matched after the first twelve months. Those are unprecedented benefits for a secured card. One downside of the card is that you’ll have to come up with a refundable deposit of at least $200 for approval. Establishing a positive credit card history with Discover, a leader in issuing cashback cards, would be worth this initial investment. While the ability to earn rewards is a bonus, building a solid credit history should be your primary goal when getting your first credit card. Also, picking a card that has no annual fee is important so you can avoid any added expenses. Selecting a credit card issuer that offers a large variety of cards is important when you’re building a credit history. It will make it easier to qualify for more rewarding credit cards later on. Your needs will change, and your credit cards should, too. Of course, the best first credit card is the one you’re approved for. 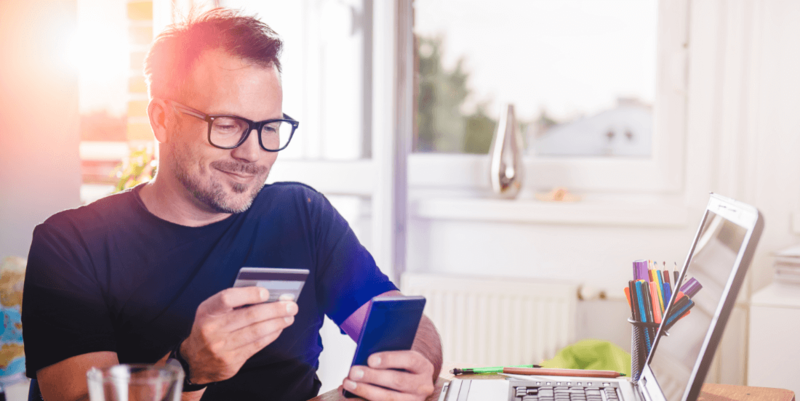 For tips on applying successfully for your first card, head on over and access our expert guide to credit card approval. We’ve all been tempted by store-branded credit cards offered to us while we’re checking out at our favorite retailer. One of the biggest selling points of those cards is the special financing they offer. Let’s face it, it’s easy to think of a credit card as a way to put off paying for something. It’s better, though, to think of a credit card as an important tool for managing and building future credit. The decision to get a credit card for the first time should be more than just a purchasing decision. It is a decision that affects your financial future. A solid credit history can serve as leverage for acquiring the things you may want in life, such as a mortgage for your first home or financing for your first car. Securing a credit card also starts the clock that tracks the length of your credit history, a factor that contributes to your credit score. For all of these reasons, you’ll want to select a starter card that you’re likely to hold onto for a long time. You’ll want to manage your credit wisely. It’s important to make timely payments, avoid carrying a balance and learn about your card’s features and benefits. You’ll also want to learn how credit card interest works and how much debt can really cost you. Getting your first credit card is a serious responsibility. Your financial future is affected by how you manage the credit that you have. So get out there and apply for your first credit card. And remember, you can earn cashback with starter cards, too.